Keep an ear out for either: the sound getting quieter over a few seconds, not suddenly. This occurs as V1 cools down as the heater supply (coming from the bridge rectifier) gets interrupted as the excessive heat causes the solder joints to open up. I have this amp, and have found many conversations on forums around the net about how bad they are and how much they are affected by heat. I have only had the amp a few weeks and it ‘banged’ when being switched on the other night, then it was ok and I was able to play through it, then nothing, complete silence. So, I turned it off and let it cool down. Had a look and it looks like one of the Power Valves has blackened, I suspect and hope this was the issue as i have ordered 4 new replacement valves. I am wondering though (as the amp gets mighty hot on the front plate particularly) whether the bridge rectifier heating up might be the issue. 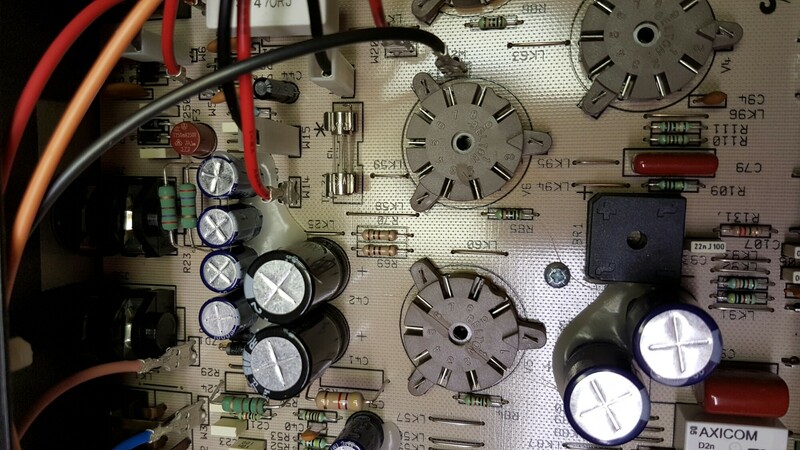 If so this ‘mod’ you show could be my solution, so I wanted to ask, did you literally put yours on ‘stilts’ like the image seems to suggest, does it not need soldering to the board via those ‘stilts’, and did you just place a standard heatsink on top of the rectifier and what is that bolt doing on top of it, and the paste looks like heat sink paste and finally what is that blobby looking liquid around the big caps? Hi Paul, these are fine amps – all the tones you need and virutally no background noise. But they suffer from heat related issues and that is because there is limited opportunity for ventillation and that is fairly common to most small amps and this one puts out a fair bit of power too. 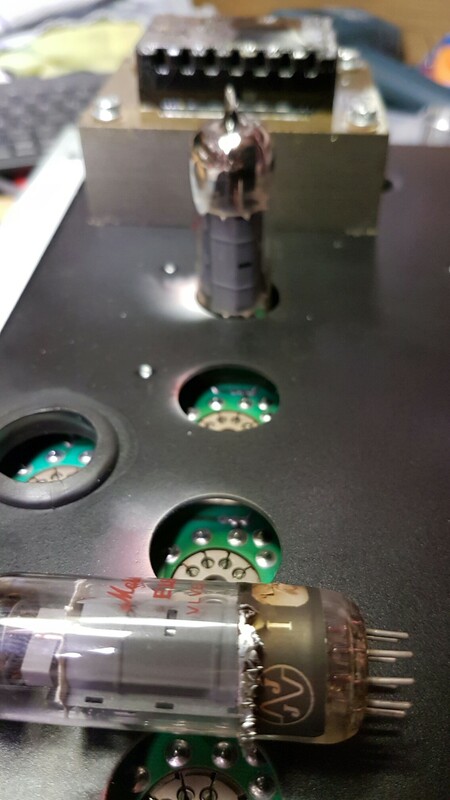 The reliability issues stem from heat damage to the PCB that a good tech can remedy. Especially dry joints around the bridge rectifier which is used to power the DC heaters on the first pre amp valve or two. Also the footswitch connector on the rear needs to make good contact with the chassis to make the switching work even if you don’t use a footswitch. The mod that I prefer is to take a bridge rectifier clean the legs with wire wool so that the solder join will be really good and solder it raised up off the board. Doing this increases airflow and the legs of the rectifier also increase head dissipation. If you can, add a heatsink to the the top of the rectifier with some heatsink compound. By doing this you can reduce the temperature of the part by a good amount maybe 10deg c from memory. 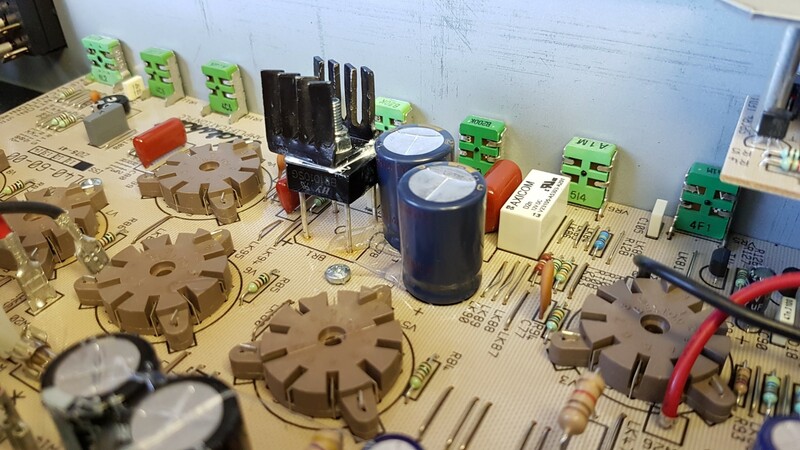 If you look at the caps next to the rectifier you may find that they are somewhat dried up and heat damaged that can be a clue to the cause. THe blobby stuff around the caps is silicone sealant or hot melt glue. All caps vibrate somewhat and eventually desolder themselves. By adding the glue we prevent this happening so soon. The other thing is the bias on these amps which marshall recommend as 1.35v on their test points but most people run a little cooler and that helps reduce the heat; e.g. 0.8 – 1.0v. Cheers for the comprehensive reply Mike, I have found that the problem on mine was in fact one of the pedals (on a pedal board) power connector had popped out and that was the cause of the bang, and then the silence. At least that is what I think it was, it’s been fine since. Yes it does get extremely how, especially on the face plate, my old jcm800 used to get hot on the top of the amp head not so much on the faceplate but i guess this is as you say a lack of space for the heat to escape in a combo. I have to say the sound out of this is amazing, absolutely worth it and if I need to have the heat mod done in the future I will certainly do that rather than sell it, the sound is perfect for me. One thing i would say is, in my experience Marshalls do get hot and of course valves sound better the hotter they get. I suspect lowering the voltage would alter the sound and maybe not give as good a sound running at say 0.8v which is a lot colder than Marshall’s recommendation, what do you think? What are the symptoms of the heat problem occurring Mike, what should I look out for should they develop, so I can if necessary catch it early … I am hoping it won’t happen but I do drive them hard!